Alert Message has been issued by the LASD – Crescenta Valley Station, Los Angeles County Sheriff. Due to the impending storm, if you have cars parked in the posted restricted parking areas, please remove them from the street before midnight, Tues, Dec. 21., or they will be towed. It is very important that the streets be cleared of vehicles so that they are not possibly swept away and damaged, or damage other property. Also so emergency equipment can pass through the area whenever possible and continue our dedicated and coordinated effort to protect lives and property. the Sheriff’s Department effective March 31, 2010.
have served with you as part of the LASD family. Thank you for allowing me to share this part of my life with you. In order to be a Great LEADER, one must first learn how to FOLLOW. More details and I’m sure a helluva party to come. Hot Time at the Equator Tonight! Sorry for the late post. Sheriff’s are serving you tonight, and they’re not serving up tickets. They’re serving dinner. 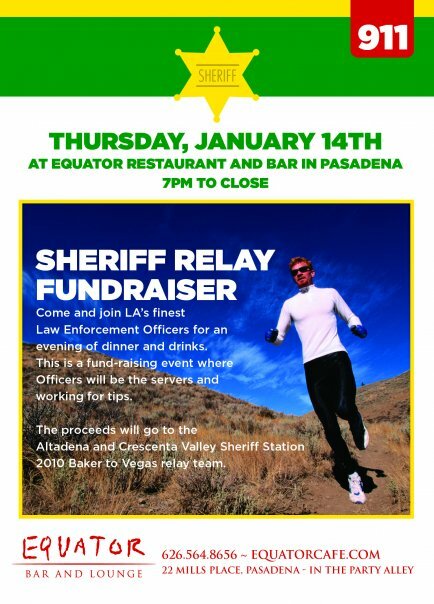 Head to Equator, 22 Mills Place, Pasadena for some fun and benefit the Baker to Las Vegas ride.